Establishing himself as a clean comic, his down home southern humor has made him a favorite in the nation’s top comedy venues. From intimate comedy clubs to sold out crowds at Madison Square Garden, the Universal Amphitheater and the Lincoln Center, Rickey’s unique style of humor resonates with his audiences unlike any other comic on the road today. He has continued to please. In November of 2002, Rickey joined fellow heavyweight comedians D. L. Hughley, J. Anthony Brown, Bruce Bruce, Earthquake, and Sommore on the Latham Entertainment Presents Tour. This multi-city mega stadium tour, produced by Walter Latham of the Kings and Queens of Comedy, was a huge success. Walter Latham will be putting them back on tour in the fall of 2003 because of the demand of more comedy from the fans. Rickey also made his mark in the feature film arena, appearing in New Line Cinema’s ”Friday After Next”, which was released on November 22, 2002. Best known as host of the 2000 season of BET’s ”ComicView”,Rickey led the show to its highest jump in ratings in the show’s ten-year history. 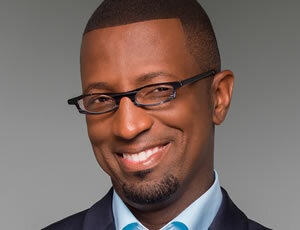 BET then quickly signed Rickey to host “The Way We Do It” during the 2001-2002 season, and that show went on to become one of the top five shows on the network. It’s his genuine love of performing that has brought Rickey many accolades on stage, on camera and off. He was a guest presenter on the 2001 NAACP Image Awards and hosted the special awards banquet for the 2002 Stellar Gospel Music Awards. In his personal life, he finds time to devote to church, to charities, to the Big Brother Program and to family. Smiley’s characters have become his comedic trademark. From Bernice and her church announcements to Coach McClainy and his lack of motivational skills, Rickey’s audiences can’t seem to get enough of him. Rickey is so convincing doing his character impersonations. He has released three comedy CDs. They are The Best of Comedian Rickey Smiley: Volume I, Rickey Smiley Prank Phone Calls Volume II, and Rickey Smiley: Volume III. These CDs are sold daily to several of his fans via phone and the Internet Volume IV and V will be released in late 2003 or early 2004. One of the most diverse entertainers today, Rickey’s fan base covers a broad range – from the very young to the very old. Grandparents often show up at Rickey’s shows, knowing they will not be embarrassed by Rickey’s material. When Rickey headlines a large venue, it is not unusual to find parents bringing their children to watch Rickey perform. His style of comedy is recognizable, approachable, and best of all hilarious. He is inspired by the support of his fans on the road. He makes it a habit to personally greet his audiences as they are leaving the shows. The top comedy club chains in the country consider Rickey a high commodity. The Improv, The Funny Bone, Zanies, The Comedy House Theatre, Carolines on Broadway and many other clubs list Rickey as one of their favorite comics to work with because of his “laid back” personality. It is this same personality that has led him to upcoming meetings with New Line Cinema to discuss making a feature film based on some of his characters such as Bernice Jenkins.